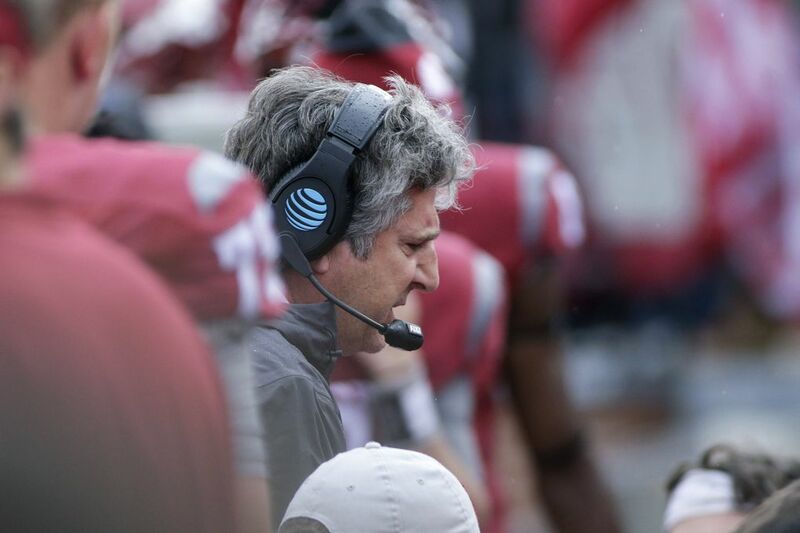 PULLMAN – After a week that saw Washington State make headlines for arrests, accusations from head coach Mike Leach about police targeting, and Leach’s scathing declaration that his team lacked toughness, the Cougars finally got a much-needed win. 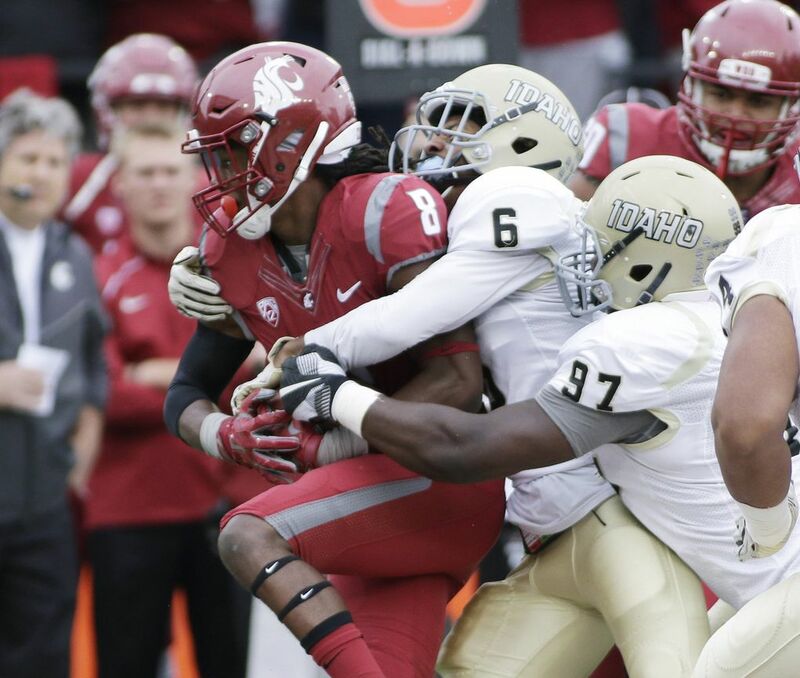 For the first time this season, WSU’s offense, defense and special teams all showed up on the same day, and the Cougars pounded Idaho 56-6 at Martin Stadium Saturday afternoon to notch their first win of the year. Special teams came up huge for WSU, with the Cougs scoring two special teams touchdowns in a game for the first time since 1973. Nose tackle Robert Barber, who was arrested for assault on Friday and is currently appealing his expulsion from WSU through the student conduct board, blocked Idaho punter Austin Rehkow’s 32-yard field goal attempt in the second quarter. Marcellus Pippins caught the deflected ball and ran it 72-yards the other way to put the Cougs up 14-3. That second special teams score came in the fourth quarter with WSU already up 42-6. Dylan Hanser smashed Idaho kick returner Reuben Mwhela at the end of a return hard enough that the ball popped out and Gerard Wicks scooped it up to score on an 11-yard return. Wicks scored two touchdowns on a day that began with him getting knocked down the depth chart in favor of redshirt freshman running back James Williams. 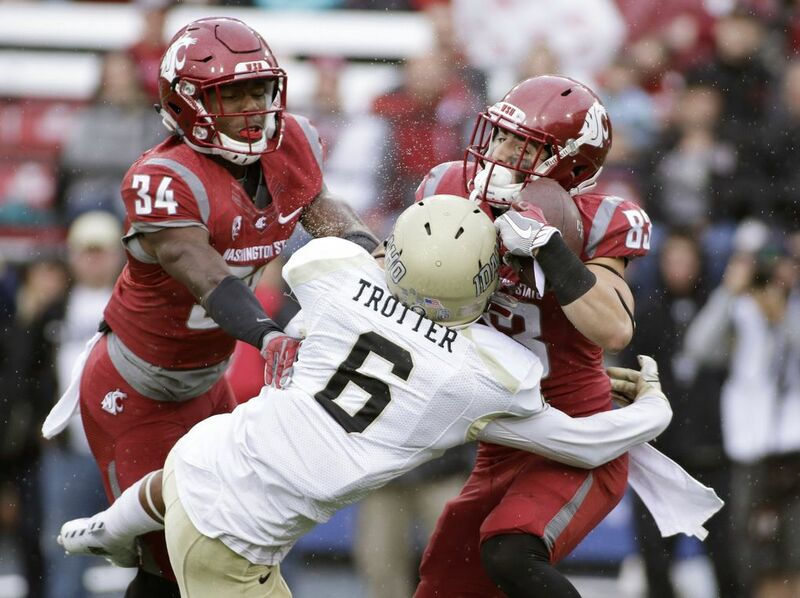 Williams, whom WSU running backs coach Jim Mastro says is one of the most talented players he’s ever coached, was elevated past Wicks on the depth chart this week because the Cougs wanted to find more ways to get him on the field. Williams did not disappoint. 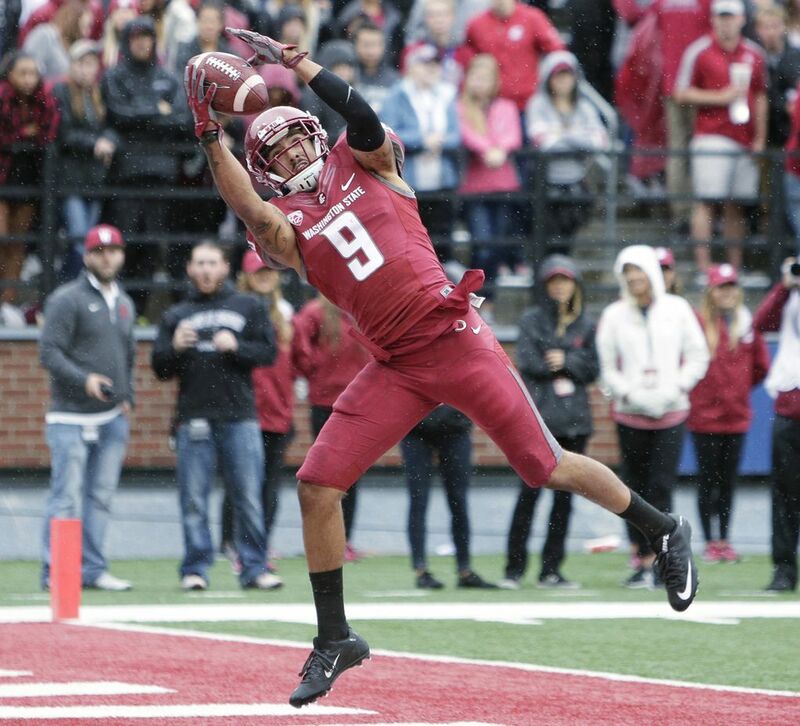 With the Cougs’ offense once again starting out maddeningly slow, Williams provided an early spark. The 5-foot-11, 199-pound back put up the best performance the Cougars have seen from a running back since Dwight Tardy had 214 yards against UCLA in 2007. Williams ran through, around and over Idaho defenders, breaking tackles and outmaneuvering opponents to finish with 126 yards and a touchdown on 14 carries. His 126 yards made him the first freshman running back since Tardy (105, 2006 vs. Washington), and is the most by a WSU freshman since Tardy’s 145 yard effort against Oregon in 2006. Williams’ first career touchdown run was also WSU’s first score of the day – a 2-yard carry up the middle to put the Cougs up 6-3 on Idaho. Till that point, the Air Raid offense had looked deceptively balanced thanks to Williams’ running and that fact that the pass game was ineffective for most of the first half. 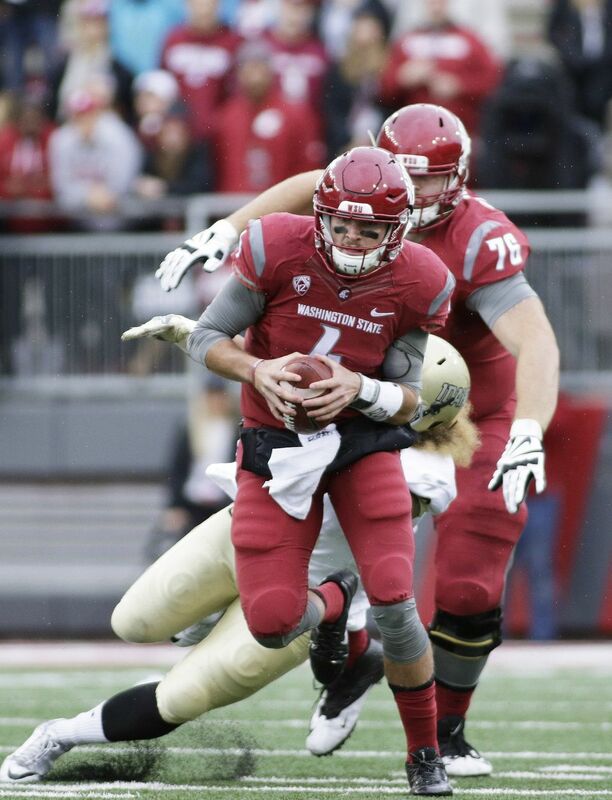 Aside from a 50-yard on-the-run heave from quarterback Luke Falk to Kyle Sweet that set up Williams’ scoring run, the Cougs had little to show for themselves in the pass game early on. Falk finished the opening quarter 4-of-8 for 61 passing yards. However, he was 3-of-7 for 11 minus the 50-yard bomb to Sweet. 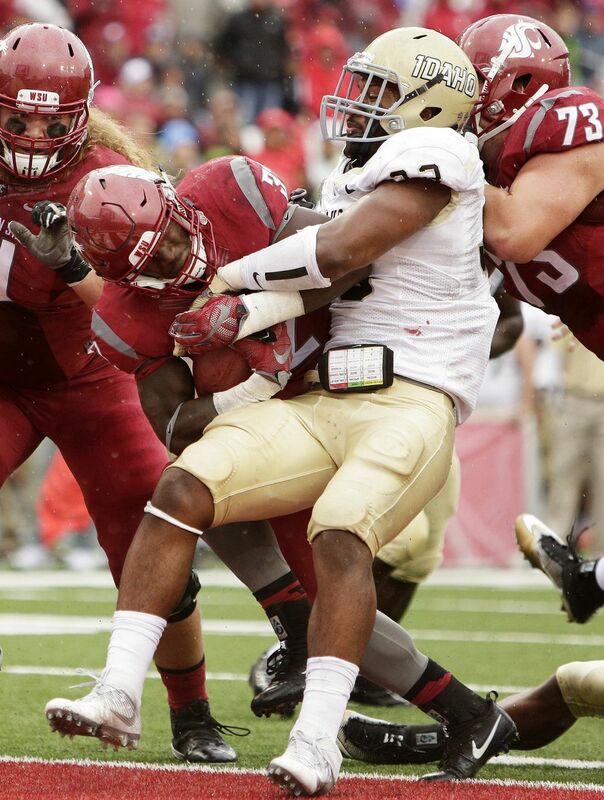 But part of that was due to the “stop-the-pass” mindset Idaho adopted against the Cougars’ offense to open the game. 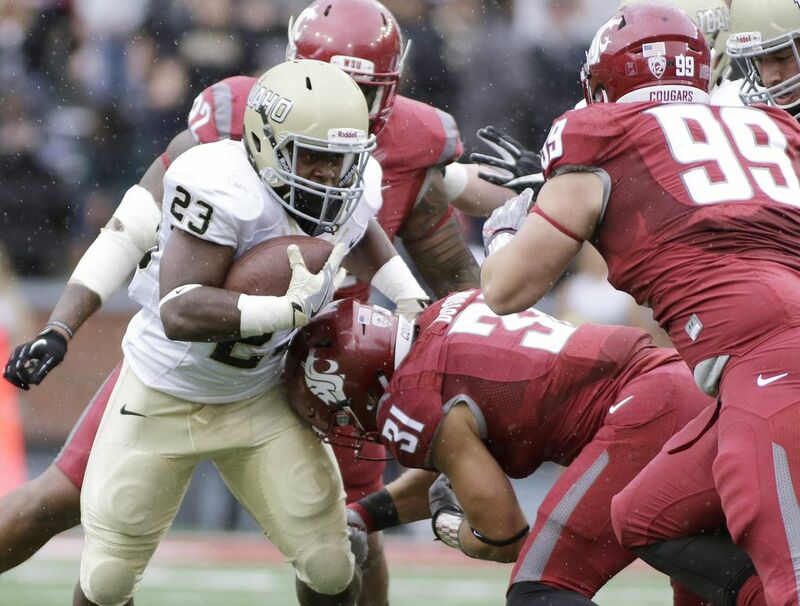 WSU (1-2) had its best rushing game of the Leach era, finishing with 228 rushing yards to 281 passing yards, with three different running backs scoring touchdowns – Williams, Wicks on a 2-yard run in the third quarter, and redshirt sophomore Alijah Lee, who had a 6-yard score late in the fourth quarter. Things did eventually pick up for the Cougars through the air though. Falk finished 21-of-36 for 226 yards, with no interceptions, and threw touchdown passes to Marks, Sweet and Robert Lewis. The defense also came through for WSU. Garrett McBroom and Dylan Hanser each forced a fumble, and the Cougars scored 13 points off the two turnovers from the defense. Idaho scored early in the first quarter on a 42-yard field goal by Austin Rehkow to open the game, and Rehkow also converted an 18-yard field goal in the third quarter. But from that point on, the Cougars ran away with the win, scoring five unanswered touchdowns to end the game. “The biggest thing about this is that we played better,” Leach said. “That’s the sole evaluation of anything – did you play hard? How well did you play?